Growing cannabis is such a meticulous process. Blowing months of hard work in the final steps of cultivating your bud would be a travesty. To maintain the flavor and potency of your flowers, you must first put your trimmings through a drying process. Once dried, you have to rehydrate the outside layer by curing your plants slowly. This will ensure your plants are the apex quality you are looking for. Let’s discuss the best curing method for cannabis. Before attempting such a vital action to your cannabis plants, you should probably know what curing is. Essentially, it’s taking your trims and putting them in an airtight container and placing it in a dark room. Curing benefits cannabis in two ways. One, it helps preserve your yields. Secondly, curing gives the weed time to draw out flavor from the center of the bud slowly. Although we are going to discuss the best curing method for cannabis, you can’t cure weed without drying it first. So, let’s get into drying and curing cannabis. Why Do You Have to Dry Weed Before Curing? The first thing you will notice when you trim your bud is that the leaves are somewhat sticky. That’s because the plant has been sitting in a moist environment. Plus, the stomata just closed when the bud was trimmed. When this happens, the plant goes into a latch ditch effort to create nutrients. As the core draws inward, it creates beads of moisture on the bud. If you were to smoke this right after picking, your flame would go right out from how wet the weed is. Therefore, you must dry the weed. To dry the weed, cut the branches off of your plant into a size that is manageable for you. Most people aim for the 12 to 16-inch range. From there, take off any sugar leaves and save them to make hash. Hang the branches on a wire. 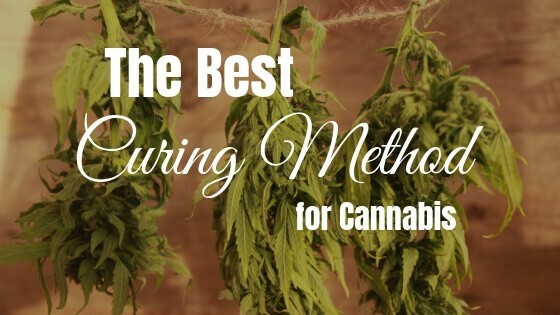 If you have time to spare, this is the most cost-effective method of drying cannabis. Nowhere to hang your bud? Don’t want to bang your head on them like you’re entering a 70’s bedroom beaded doorway? Another option to dry your weed is to get an Herb Drying Rack. That's a bit more of an investment than just hanging, but it gets the job done efficiently. The needs of bud during the drying process differs from when it was attached to a plant. For one, you want to keep the weed in the dark and dry area. The temperatures should range from 60 Degrees F to 75 Degrees F.
All of these factors will be unique to the strains of plants you have and the actual climate outside of the area where you grow property is situated. As for humidity, keep the room around 45 to 55%. You’re going to do this process anywhere from a week to 15 days. While you want to keep the room dark and relatively cool, you also need to circulate air. Make sure the area is well-ventilated. Perhaps invest in a few fans and/or a Powilling Mini Dehumidifier. In a real time crunch, you can opt to dry out your bud in the oven. Whatever you do, don’t microwave your weed. It will cook your bud. Plus, smoking microwaves can’t be a good thing. After all your close monitoring, it would be a shame to over-dry your bud. Therefore, check your plants often to see if they are getting brittle. You want to add moisture back to your bud just before it seems void of all. As the bud is drying, all the moisture is retained in the middle of the nugget. This is your plant’s last-ditch effort to instinctively latch onto its last bits of nutrition and stay alive. Around a week, start to touch the stem. If it makes an audible crack but doesn’t break, then it is ready for curing. When you bend the stem and find it is still hard as a rock, then you need more time. In the event the stem snaps right off, then you have overdried your bud. Still, go through with the curing process. However, you’ll notice when you break up your batch to smoke it later that the bud has smashed into little powdery bits. The best curing method for cannabis is one that is cost-efficient and produces a substantial yield that is full of flavor and high in THC. To achieve this doesn’t need to be an expensive endeavor. Begin with manicuring your branches. Separate the buds from the stems. Put the trims inside of an airtight container. Multiple containers will prove to be a solid choice as an incubator for your cannabis cure. Let's start with what not to use. Don’t put your weed in plastic bags. Plastic is a porous material that will soak up all the water vapors in your bud. 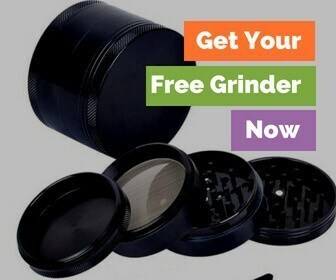 This will completely negate the whole reason you’re curing the weed in the first place. Retaining moisture also opens the door for mold and mildew to grow. During the curing process, cannabis goes through biosynthesis. This is when THCA converts to THC, and other cannabinoids come into existence. Synthetic molecules in human-made plastics can have adverse chemical reactions with the cannabinoids developing in the trichomes of your bud. If you need to use a bag for financial reasons, you can try a Heavy Duty Brown Paper Bag. They're more durable and block out the light. However, they are prone to ripping. This may allow air to leak in. You want a container that allows enough space for you to pack your bud in loosely. Just like air is pivotal in a grow room, it’s also essential in a curing medium. Shoving weed on top of one another will create a wet spot in the middle of the container. Plus, mold and mildew can foster in between. Additionally, all the top and bottom layers of weed will dry out. Glass is one of the best options for curing cannabis because its impermeable to moisture. Therefore, you won’t change the flavor profile or potency of your weed. Depending on how much weed you grow, you can get away with a Wide Mouth Preserving Jar. Its wide mouth makes it easy to get nuggets in and out. The jar is also large enough to allow air to circulate freely between buds. While glass is excellent for curing, the only downside is that it’s transparent. Just ask the makers of milk, sunlight can destroy some of the beneficial compounds in products. To protect your cure from UV rays, stash your trims into an Amber Medical Glass Jar. After you picked the right container, store them in an area much like you did during the drying process. You need it to be dark and dry. Within a day, you will notice your buds puff up like a marshmallow. If that doesn’t happen, then you overdried your trim. As it has been through the whole growing process, fresh air is vital to plant health. In the first week of curing, open the containers multiple times throughout the day. This allows the buds to breathe for a few minutes. Letting your bud breathe also gives you the opportunity to check in on its health. If it wreaks like ammonia, that means an anaerobic bacteria is destroying your weed. In turn, your end product is going to be moldy cannabis. How Long to Cure Cannabis? After the first week, you can reduce the breathing process to a couple of times a week. Your cannabis should be cured within two to three weeks. However, four to eight weeks is the sweet spot. In the case of some strains, it can take up to six months to properly cure buds.